Football season becomes a time of realization that life's most important victories are won off the field. 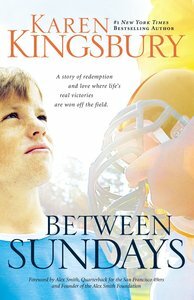 A star quarterback with much to learn, a younger player with much to give, and a woman with a heart for underprivileged kids---thrown together into a time of self-discovery and a new awareness of the things that matter most. - Publisher Aaron Hill has it all---athletic good looks and the many privileges of a star quarterback. His Sundays are spent playing NFL football in front of a televised audience of millions. But Aaron's about to receive an unexpected handoff, one that will give him a whole new view of his self-centered life. Derrick Anderson is a family man who volunteers his time with foster kids while sustaining a long career as a pro football player. But now he's looking for a miracle. He must act as team mentor while still striving for the one thing that matters most this season---keeping a promise he made years ago. Megan Gunn works two jobs and spends her spare time helping at the youth center. Much of what she does, she does for the one boy for whom she is everything---a foster child whose dying mother left him in Megan's care. Now she wants to adopt him, but one obstacle stands in the way. Her foster son, Cory, is convinced that 49ers quarterback Aaron Hill is his father. Two men and the game they love. A woman with a heart for the lonely and lost, and a boy who believes the impossible. Thrown together in a season of self-discovery, they're about to learn lessons in character and grace, love and sacrifice. Because in the end life isn't defined by what takes place on the first day of the week, but how we live it between Sundays. Aaron Hill has it all---athletic good looks and the many privileges of a star quarterback. His Sundays are spent playing NFL football in front of a televised audience of millions. But Aaron's about to receive an unexpected handoff, one that will give him a whole new view of his self-centered life. Derrick Anderson is a family man who volunteers his time with foster kids while sustaining a long career as a pro football player. But now he's looking for a miracle. He must act as team mentor while still striving for the one thing that matters most this season---keeping a promise he made years ago. Megan Gunn works two jobs and spends her spare time helping at the youth center. Much of what she does, she does for the one boy for whom she is everything---a foster child whose dying mother left him in Megan's care. Now she wants to adopt him, but one obstacle stands in the way. Her foster son, Cory, is convinced that 49ers quarterback Aaron Hill is his father. Two men and the game they love. A woman with a heart for the lonely and lost, and a boy who believes the impossible. Thrown together in a season of self-discovery, they're about to learn lessons in character and grace, love and sacrifice. Because in the end life isn't defined by what takes place on the first day of the week, but how we live it between Sundays.